This article is about the golden Mushroom variants. For the identical items in the Mario Party series that add five to the player's roll, see Golden Dash Mushroom. Mario & Luigi series: Restores all HP and BP. Mario Party series: Allows player to roll three Dice Blocks in one turn. New Super Mario Bros 2: Gives the player 50 or 100 coins on contact. The Golden Mushroom (sometimes referred to as a Gold Mushroom) is an item that appears in several Mario games. It is a rare Mushroom, sometimes depicted with a crown on its head, and it always gives the player a positive effect when used. Golden Mushrooms sometimes vary by color and luster between games, but they are always a strong item. Originally a flying Golden Mushroom would have appeared in that game but was removed for unknown reasons. They are worth extra lives, like 1-Up Mushrooms. The palette they use is actually the beige palette used by Monty Moles and Floating Mines. Gold Mushrooms appear in New Super Mario Bros. 2 in the Coin Rush mode and replace 1-Up Mushrooms, and upon contact, Mario gets 50 coins (or 100 coins if he is Gold Mario). It lacks the crown from its contemporary Mario Kart appearances and the coloring is reversed from all other occurrences, with the spots being darker than the background. The Golden Mushroom appears in Mario Kart 64 and all main games starting from Mario Kart: Double Dash!! Since Mario Kart 64, it gives the player an endless amount of speed boosts for a limited time. Additionally, in Mario Kart: Double Dash! !, it is Toad and Toadette's special item. The Golden Mushroom's initial appearance is a glowing gold Mushroom, but since Mario Kart: Double Dash! !, it has been given a gold crown with red jewels as well. This item was originally going to be in Mario Kart: Super Circuit, but never made it to the final game. The Golden Mushroom makes an appearance in Mario Kart Arcade GP under the name Miracle Mushroom. It is one of Toad's special items, and it grants the user invincibility, as well as the ability to knock over any rival karts they run into, for five seconds. The Miracle Mushroom is functionally identical to the Star. A variant of the item known as the Miracle Mushroom+ exists. This variant extends the duration of the invincibility. The chance of obtaining a Golden Mushroom is more common in Mario Kart 64 than in later installments. In the game, players can obtain the item in second place, although this usually only happens when the first-place player is very far ahead of the second-place player. Triple Mushrooms are also more common to obtain in second place than Golden Mushrooms. In Mario Kart 64's Operation Card, the Golden Mushroom is called Super Mushroom. In the European version of Mario Kart 7, it is called Golden Dash Mushroom. In Mario & Luigi: Superstar Saga and its remake, it fully restores both Heart Points and Bros. Points for a single brother. There are only five Golden Mushrooms in-game, though it can also be stolen using Swing Bros. from Fawful, Popple, and Birdo. In the remake, ten Golden Mushrooms can be obtained from the Information Booth after 800 attacks are dodged. They also have a rare chance to be dropped by Clumphs after battles. Mario & Luigi: Bowser's Inside Story's Star Candy replaces the Golden Mushroom and in Mario & Luigi: Dream Team and Mario & Luigi: Paper Jam, Star Candy is replaced by various Candies. Peach receiving 50 Coins for rolling triple sevens under the effects of a Golden Mushroom in Mario Party 3. In Mario Party 2 and 3, the Golden Mushroom is an item that allows players to roll three Dice Blocks on their turn. It is stated to be Mario's favorite item in the latter game. Rolling three of the same number earns the player 20 Coins, and in Mario Party 3, rolling three sevens earns the player a 50 coin bonus. 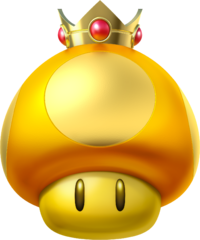 In these titles, the Golden Mushroom lacks its crown and has white spots and a tan body, appearing more like a yellow Super Mushroom. It is replaced by the Super Mega Mushroom in Mario Party 4, the Super Mushroom Capsule or Super 'Shroom Orb in Mario Party 5 ,6, and 7, and the Thrice Candy in Mario Party 8. Conveyor Meltdown in Mario Party: Star Rush. In Mario Party: Island Tour, Star Rush, The Top 100 and in Super Mario Party, an identical item known as the Golden Dash Mushroom lets the player add five spaces to their roll. In Mario Party 10, players can get Golden Mushrooms in their carts to score three points in the minigame Movin' Mushrooms, and in Mario Party: Star Rush, players have to sort between Mushrooms and Golden Mushrooms in the Coin Chaos minigame, Conveyor Meltdown. The Golden Mushroom takes on its more traditional appearance starting with Island Tour. Golden Mushrooms, referred to as Gold Mushrooms, appear as rare collectables in some courses in Captain Toad: Treasure Tracker, looking and acting as they do in New Super Mario Bros. 2. These mushrooms are usually a secondary objective in the courses they appear in. Some Gold Mushrooms can only be found through invisible Pluck Patches, which can be seen once Captain Toad approaches it, or reveals them with his headlamp. Golden Mushrooms are not physically present in Mario vs. Donkey Kong: Tipping Stars, but are featured as emblems on several banners in the background of Swirling Courtyard. Golden Mushrooms are rare items in the puzzle and RPG hybrid called Puzzle & Dragons: Super Mario Bros. Edition. It is obtained from ? Blocks or dropped after defeating some enemies with a 10+ combo, such as 2-Goomba Towers and Paragoombas. There is an even rarer variation called Grand Gold Mushroom. In Super Smash Bros. Ultimate, the Golden Mushroom (named the "Golden Dash Mushroom") appears as an Ace-class support spirit, using its artwork from Mario Kart 8. When equipped, it makes the user temporarily giant at the start of battle. The spirit was originally only obtainable during the "Oh Yeah! Mario Time!" spirit event that ran from December 27, 2018 to January 1, 2019; as of version 2.0.0, it can be found at any time on the Spirit Board and Vault Shop. To earn the spirit, the player has to defeat a gold Mii Brawler on the Figure-8 Circuit stage. Golden Mushrooms generally show up in the Item Windows of racers near the back of the pack. It's an awesome tool for those unfortunate enough to be in that position as they can use it to catch up to those in front. Unlike other Mushrooms, however, you can tap the Item Button as many times as you'd like to maximize your boost. Be sure to cut corners where possible with this item. Gives you a speed boost whenever you press L/X, but only for a short time. ↑ von Esmarch, Nick. 2012. New Super Mario Bros. 2 Prima Official Game Guide. Page 17. This page was last edited on April 13, 2019, at 11:01.